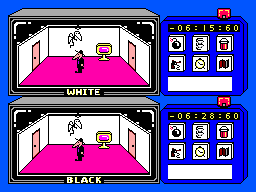 This game is based on the famous duelling white spy and black spy from MAD magazine. Now stars of some recent Mountain Dew commercials, your job if you choose to accept it, is to gather the secret plans and get away before the other spy. The gameplay is decent, if not a little too easy. You walk around looking behind things to find the all the pieces of the plan. Along the way you have the opportunity to fight and take materials from the other spy. You are also able to use booby-traps to take things from the other spy. These 2 things are essential to winning the game, but they are not difficult. This would be much more fun with a multiplayer option. Nothing great here. 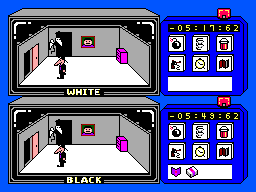 The cartoon look does a good job of recreating the feel of the spy vs spy stories. 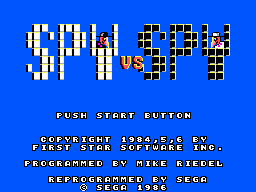 But there are games with better graphic on the SMS. Some things are slightly pixilated. The music is very repetitive and annoying. There is not much to the sound effects either; they are not bad but not good either. A bright spot the controls are spot on! Making fighting and/or the setting of booby-traps easy. Moderate at best once you beat this game, which won't take long, there is not much desire to play it again for some time. Although at least where the pieces are hidden changes with each game for a different challenge each time. Not a bad game but not exactly a must have. Fun to play and probably better for younger gamers or die-hard MAD fans.